The BSA Ultra. 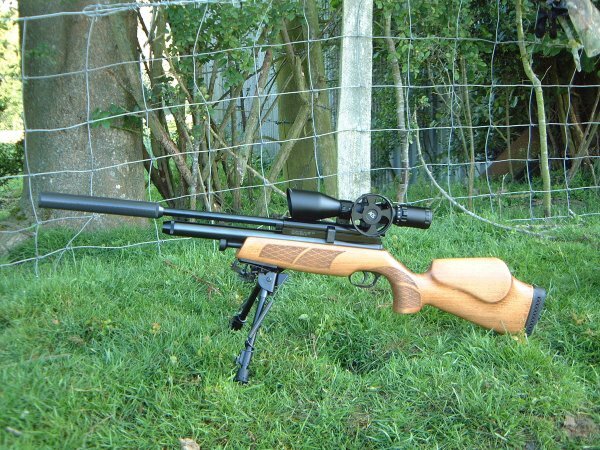 A quiet, unassuming rifle, that's modestly priced and gets on with the job. That's fine by me, because I'm a fairly quiet, unassuming bloke. But now and again we all get the urge to go a little wild, don't we? And in air rifle terms that means customising and tuning. That's what's happened with this particular .177 Ultra, which happens to be unique, because it has a number of tweaks, including a regulator - the first of its kind. Some shooters love to dress up their rifles with as much bling as they can lay their hands on. Polished scope mounts, polished bolts, fancy stocks. And why not, if that's what makes them happy? But there are no shiny bits on this one. That's not what this gun's about at all. It's totally unassuming on the outside. It also happens to be quietly confident on the inside. Oh, and deadly accurate to boot. That's because this rifle's more about bang than bling, and all the upgrades are totally functional. I had a number of modifications done to this rifle from the outset, then a year later I went back to get the regulator fitted. The only work I carried out myself was to strip the beech stock, sand it down and finish it with CCL Conditioning Oil. Even this is a functional upgrade, as the stock feels more "grippy" with its new matt oil finish instead of the original shiny lacquer. 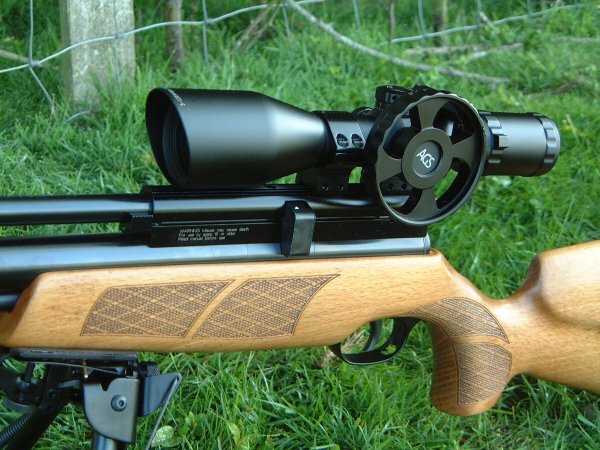 BSA's Ultra is a little gun that has proved to be a big hit with shooters in both single and multi-shot format, and in .177 and .22. 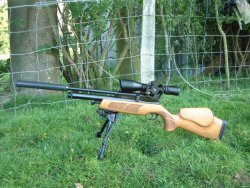 It's rightly been hailed as the perfect rifle for hunters targeting quarry from inside hides or inside vehicles, and it's good for junior shooters too. But the Ultra is much more than that. Despite its diminutive size there's nothing diminutive about its performance. The Ultra is also a great rifle for shooters wanting something a little lighter, a little shorter and a little handier to carry around all day without feeling too exhausted by the time the game bag's full and it's time to go home. Straight out of the box the Ultra performs just as well as its bigger rivals - and outperforms some I could mention. But like most things in life, good things can be turned into great things. And how do you go about that? Well send it back to its creator of course! BSA gun guru John Bowkett can work his magic in several ways, and that's exactly what he's done with this particular example. First of all he can give it a tune-up, better known in BSA circles as a blueprint, polishing and fettling the internals to make everything work just that little bit smoother. Then there's the issue of shot count. While 30-35 shots per fill in .177 is perfectly adequate for hunting, many shooters want more so they can take their rifle to the range to put down some serious amounts of lead, or just to their back garden for a fun afternoon' s plinking. Whatever the reason, help is at hand in the shape of a replacement extended air reservoir. Combined with the blueprint, this raises the Ultra's performance to 50 solid shots - a big achievement from such a small gun. The only downside is the fact that BSA's little SAS silencer will no longer fit as the extended reservoir gets in the way. In fact, this is no real disadvantage at all, because in truth the SAS moderator was something of a compromise, with performance sacrificed for its small size. But with BSA's barrel sporting a standard 1/2" UNF thread, fitting a replacement is easy. I used to use one of Weihrauch's new silencers, as fitted to the celebrated HW100K, and this really is a can that can, being both ultra-light and ultra-quiet. 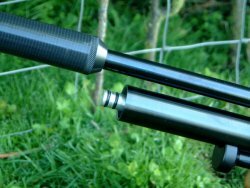 But John is now producing custom-built carbon fibre moderators that are matched to your specific rifle and calibre. Performance is similar to the HW can, but the noise downrange is significantly reduced. There's even a Bowkett tweak when filling the rifle. 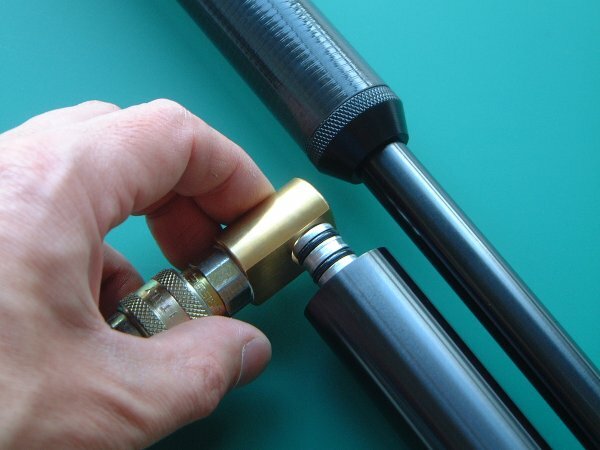 The standard Ultra uses a filling probe that plugs into the reservoir. There's nothing wrong with this at all. But if you really believe in making life easy for yourself you can get John to replace the filling unit so the probe is mounted on the rifle itself. This means the air hose is now free to swivel and gives you the ability to lay the rifle down or angle it any way you want while you're charging the reservoir. It's something of a luxury, but I really rate it in terms of convenience and practicality. But the ultimate Bowkett feature has to be the regulator, which makes this particular rifle the first in the world - but not, I'm sure, the last, once you've read what it can do! The regulator eliminates the power curve, increases the shot count further still and reduces the lock time - the time it takes the pellet to leave the barrel after the trigger's been squeezed. According to the great man himself the regulator transforms the Ultra into a "new and totally different rifle". So it was time to visit the range to put my "new" gun through its paces. As my AGS 3-12x44 Mini SWAT Mil-Dot telescopic sight had been removed while John installed the regulator, the first order of the day was to re-set zero, loading up with H&N Barracuda Match, with Bisley Magnums being a perfectly acceptable alternative. This little gun loves these heavy pellets. 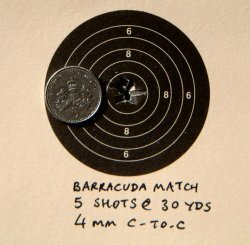 It only took a few shots to adjust the scope at 25 yards before it was punching out near one-hole groups. Then it was back to the 30-yard mark or more of the same, 30 yards being my preferred zero with a .177 12ft/lb rifle. Accurate? Oh yes. Totally different rifle? Well, not quite, because the Ultra had always been a good rifle. But it was certainly quieter, crisper and even more precise, and then there was that huge grin factor too - something which shouldn't be underestimated. How about the stats? Well, boring as it was, it needed to be done, especially when I was trying to gauge how well the regulator worked. The standard Ultra needs a 230 bar fill in .177, while the blueprinted Ultra can get by quite happily with 200 bar. The regulated Ultra is a different beast entirely, as the reg ensures smooth, consistent shots across a far wider range of maximum and minimum air pressures in the reservoir. This is where it pays to have a 300 bar air cylinder to fill your rifle, because the regged Ultra can be filled to a massive 280 bar. If you want a regulator but haven't got access to these sorts of pressures then don't worry. The consistency of the shots will be exactly the same, you'll just have fewer of them, so just charge the rifle to 200 bar or whatever your cylinder can dish out. But with a full 280 bar charge, I was absolutely delighted to find my Ultra cranked out an impressive 70 full-power shots. That's more than double the performance of the standard Ultra! There's more of that grin factor. How about consistency? It was time to break out the chronograph. To ensure a fair test, the pellets were individually weighed to make sure each one behaved the same way. Most pellets in the tin tipped the scales at 10.4 grains, with the rest being slightly lighter. Only those weighing exactly 10.4 were used. The results were reassuringly consistent, showing a spread of 708 feet per second to 717 feet per second - a variation of just nine feet per second, with an average power output of 11.75ft/lb. As you've now seen, John Bowkett's tweaks have made an already good gun even better, but of course this all comes at a cost. It's perfectly true that the money spent on this rifle could have been used to buy a more expensive airgun in the first place. But that's missing the point. It isn't just a more expensive rifle, it's a customised rifle. And better still - it's my rifle!